I managed to squeeze my long run in yesterday evening to allow me time on Friday to run along the Rhymney Valley Ridgeway Trail near my house. So, on a beautiful autumn evening I donned my snuggly winter beany and ran a 20 mile out and back urban route. Don't worry, I wore other clothes too, but the beany really marks the change in season. Having run the Cardiff Half marathon last weekend (time = slower than last year), the pressure was off, so I decided to use my heart rate monitor to keep to a pace that would not take my heart rate above 75%. 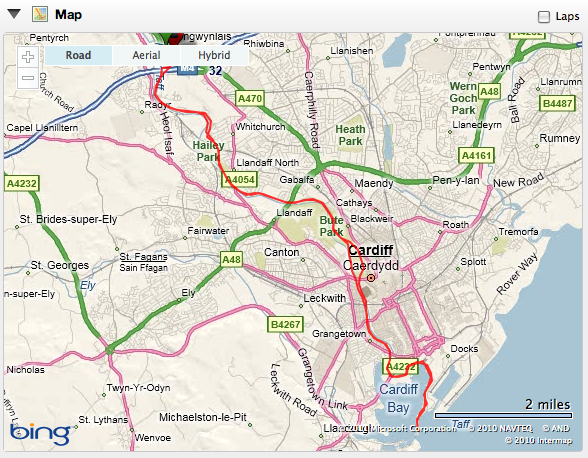 This made for a very relaxing pace and an opportunity to really enjoy the seasonal changes along the Taff Trail. 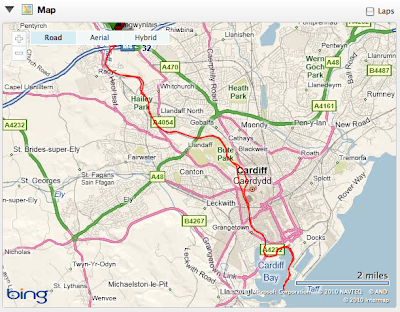 It's a great route starting in the hills to the North of Cardiff, through the city, through parks, past castles, the millennium stadium, our beautiful millennium centre and onto the barrage until you reach the sea. There was no energy dip or psychological struggles on this run, but I suffered with bad leg cramps in the last 3 miles which forced me to take walk breaks...enter another challenge to master and overcome! Other than that a great run. Not sure what happened at the start of my run! I must have been excited to be out of work!